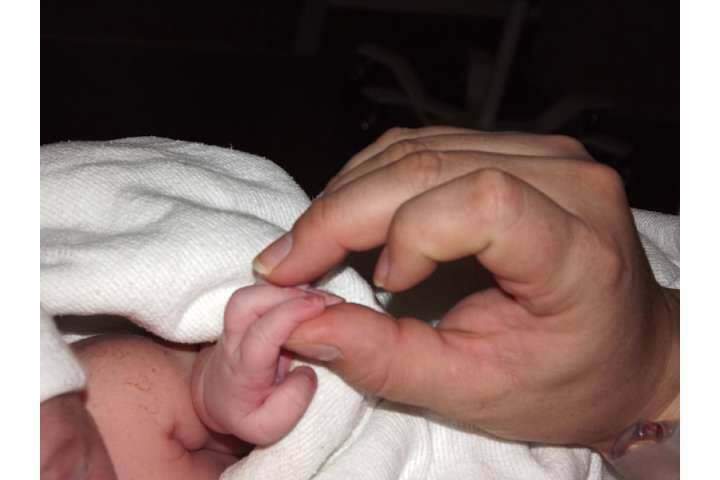 In late December of 2011 I became a mom for the first time. The word "miraculous" does not even begin to describe what that was like. You can ask me more about this if you want to either a) see me cry, or b) hear lots of gory details that you probably didn't want to know. But I am shameless about the fact that I love to tell her (our) birth story. The nine long months prior to that were filled with nausea, fears, restless nights, cravings, impatience, more fears, and learning how to respond to the tactless yet bold things people say to pregnant women (my favorite was from a woman I hardly knew who looked me up and down and then tried to guess how much weight I'd gained). But in addition to the bothersome aspects, pregnancy also brought an ever increasing anticipation, daydreams about singing my baby to sleep, holding her in my arms, and playing with her all day every day. I was given the gift of being able to conceive and carry a child. I am and will forever be grateful to experience that miracle. That said, I had no real idea what it meant to be a parent. Who of us does before we have children of our own? I imagined it being fun to have a child of my own, but I also imagined that it would be virtually all hard. It would mean little to no sleep. It would mean giving up any shred of independence and spontaneity for the necessary evils of changing dirty diapers and being home by 7:00 pm. It would mean sacrifice on a grander level than I had ever experienced or imagined. Now, granted, all of that was true. I was up to my elbows in baby poo. I was sleep deprived to the point of delirium (and our baby was a good sleeper)! I even remember a time when a friend told me that she had a new baby niece, and my next question to her was to ask if it was a boy or a girl. I remember the intense emptiness I felt those first few weeks and months as I grappled with my new role as the primary life-sustainer for this tiny innocent human being and clung to my sanity by a thread. What I did not imagine was how much indescribable joy would saturate my life the night Shiloh was born. It was instantaneous. From the first moment they put her on my chest I was madly in love and totally enamored with that baby girl. The moment after that moment I was yelling, "What's a girl gotta do to get a cheeseburger around here?! I am STARVING!" True story. Pushing a human out of your body will really take it out of you. No pun intended. Plus they don't let you eat while you're in labor. I guess they figure that you're already all jacked up with hormones and delirious from the pain so why bother with feeding you? Anyway...I digress. The truth is that I was surprised by how much I simply enjoy being a mom. I am fulfilled in a deep and gratifying way every time I hold my girl. She is the spitting image of her daddy and that in and of itself brings me joy. The role of Mommy fits me and I love it. My priorities are very clear in my job as a mom: Shiloh comes first. Everything else comes second. I can do that. "What has been the most surprising thing to you about being a mom?" It seems to be a question I get a lot. My answer is usually the same. The first part is what I've already said about the enjoyment and fulfillment I get from being someone's momma. The second part is that I am consistently surprised by how quickly being with your child can go from the height of happiness to the height of frustration in 0.5 seconds flat. One second we are cuddling on the couch together having a moment of tranquil mother-daughter bonding and the next second she is screaming at the top of her lungs, throwing a full-blown tantrum because I will not let her have some of my Diet Coke. From contentment to contention in less than 2 seconds. As I am writing this I'm realizing that it is not all that different from those very first few moments after giving birth: dreamy, yet ravenous. As the late great Rich Mullins said, "Our hells and our heavens are so few inches apart." It is true in so many ways.